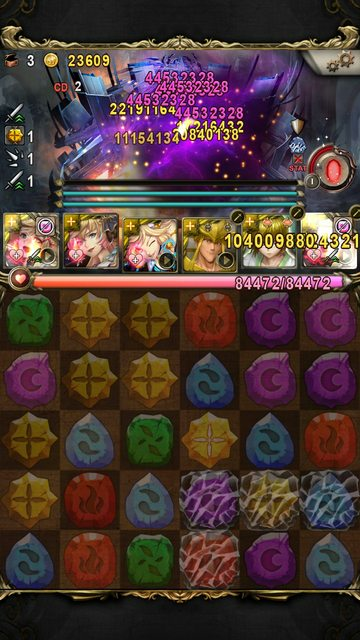 For wave 10a, I didn't want to bother with counting the 23 runes, so again I planned to use Yusuke's EP10 skill the round before to get a fixed board. To deal with the vortex, I added Kurama for his time tunneling skill. Then I'd just need to spin the vortex from start to end, reverse spin the path used to get back the original board position, then follow a pre-planned spin path for the 23 runes. To remove the enchanted runes, Kurapika is paired here with Gon. I also wanted to remove the craft so that farming would be shorter (don't need to activate the craft to deplete the charge in wave 10a), but the team lacked firepower/actives to one-shot the rest of the mini bosses since the team had no persistant boosters (Circe/Cass/Raizen/etc) apart from Kurapika. Sensui's cd6 burst needed 6 or more light/dark runes, so the craft was also needed to generate it, which I used in wave 3 (first HP bar). Cleared all of the 10-4 stages with Darkness teams (though unfortunately I forgot to take pictures or notes...). DC: Enchantment but needs to leave RGB runes. Attack boost preferable. Don't use bubble since the enchantment isn't reliable. When stalling on mobs, try to target CD3 mobs first, or leave multiple enemies alive. Most difficult stages: R1, R8b. R3b can be tricky if you just aren't getting skydrops from Darkness. R1: prep 6 combos (at least 2 combos of light or earth ) while storing CD. After getting hit once, Faraday, Sensui, Kurapika, and spin prepped board. R2: 1-combo stall for all actives. Use Darkness when ready. Try to kill after getting hit. R3b: Spin. Should be safe with minimum 6 combos. Can use Faraday to boost combo count if needed for healing/burst. R4: 1-combo stall for all actives. R5: Faraday and Sensui to kill. R6a: Switch Sensui to remove the spin time debuff. Turn on Kurapika, and Darkness after Sensui's dmg reduction wears off. Spin 1-2 combo under orb count to build multiplier back to 6x and stall for actives before killing. R6b: Hubble, Faraday and spin. R7: 1-combo stall for all actives. R8a: Just spin, should try to take at least 2 turns. Make sure RGB runes and 6 light runes are on the board (frozen ok). Use DC to enchant board for 8b (this will enchant frozen runes as well, so you can use this to avoid skydrops eating your enchanted runes). R8b: Try not to take more than 1-2 turns to prep. Once board is ready, switch Kurapika and use Sensui (EP6) and Kurapika (EP12). Stack light and dark runes while dissolving enchanted RGB. R9: Hubble and/or Faraday, spin. R10a: Spin, heal and store EP. After 40 hits, and with 6 light or dark runes on the board, use Hubble and Sensui. R10c: Spin at least 5 combos per turn. After the masked rune turn, use Kurapika (EP12) to increase spin time and clear as many runes as possible. After 60 runes, you're done. I've also added the following team/strategy for 10-3-4-3 to the first post. Most of the bosses are dragons, making it a very suitable stage for Natsu, except for Ghroth (2nd form is 97+mil HP, monochrome runes) which you'll need to kill in 3 turns. Rococo, Fthaggua and Zhurong is used to burst it in 1 turn with a pre-spin path. Natsu's combine skill solves the 9+ combo shield by dissolving a single group of 3 runes at the top. Genkai's switch ability lets her convert fire runes 3 turn in a row, which is useful for Cthugha's triple rage/revival. I've Stuck this thread and Unstuck the old one on the Ninth Seal. Given that many people were lucky/rich enough to draw YZ, I thought it's worth refreshing the clears from my channel using him. He's a lot faster and safer than what I had previously (mostly Pompeii). Most of these are 4-5 minutes, with the longest being 8 minutes due to orb/hit shields. The one caveat is that if you fluff the 7 combo spin on 10-3-3-3 then you need to stall 8 turns for your CD to come back so you can try it again so it's a bit slow in that case. On the plus side, as long as you spin normally you'll never die! Videos and Strategies in spoiler tags. I brought Lancelot and Samle for skill grinding, but they are useful for enchantress effect and HP boost respectively. 1, 2, 3, 4a) Spin through. Once YZ is ready, use it for the 30 fire runes. All members are important. Don't bother bringing DC. 10a) YZ for Dark and two other rune types that aren't water. Bishamonten, Feng Chih Hen. Spin from the green to red vortex, then reverse it. From the 5th column and 4th row, move the rune one to the right and one up. 3b) Spin once to clear as many marked runes as possible. Spin to kill on the second turn. 6a) Y'golonac to clear the board. Avoid earth runes in initial dissolve. 10a) Y'golonac and spin through. Switch Hiei and use EP skill 1 in emergency if there are too many earth runes. All members are important, mainly because you want 25204 or more HP so you can grind through the last stage if needed. 8b) Todd, YZ for heart and water, Khaos. Hope you get 1 heart rune! If you mess it up... you have enough HP to grind for 8 turns to repeat the process. Ubume can be switched with another booster. It's ideal to have HP as high as possible to make the orb shield stage safer. 1a, 1b, 2) Stall a bit on stage 1 so that you can have Yusuke ready for stage 3. Turn on Lancelot and Ubume whenever they are ready. 6a, 6b) If you didn't use YZ last turn, then use Lancelot skill 1 and YZ to generate dark and water runes. You can then 1-combo the 2nd form. 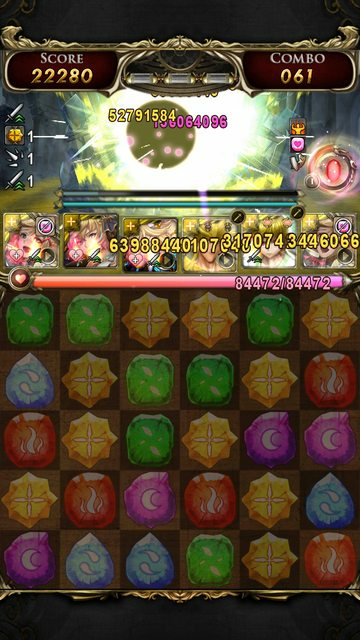 If you did use YZ, then spin 1-2 turns clearing as many non-earth runes as possible. Eventually, you can use Lancelot skill 1 to convert and the dark skydrops will kill it. Thanks to Lancelot, a chunk of the earth runes should be cleared away making the 2nd form easier. 8a) YZ for dark, earth, water. Take note of the board pattern - the 7 initial combos guarantees you will hit 8+. 8b) Grind through. Note that with this team, you have enough HP to tank 2 hits. Hence, if you're ever unsure of the number of orbs or can't confidently hit 7/8 consistently, then just spin 6 combos. You will NEVER die. 9, 10a) Turn on Lancelot and Ubume. You can use YZ once between these two stages. Feel free to use it on stage 9 to make spinning easier. You can just spin through the burning runes on stage 10a. 10b) Yusuke EP skill 2, Samle, YZ for water, dark, water. This gives you an easy 5 combos. 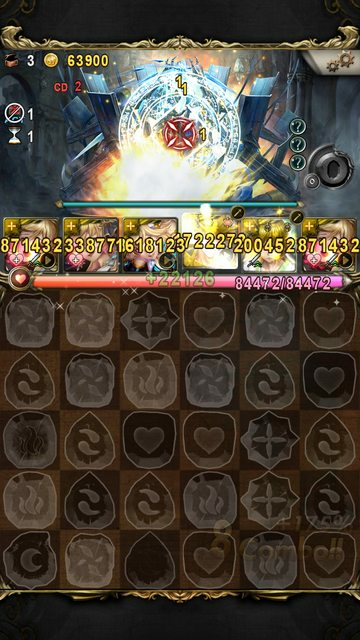 10-4-3-3 with Dual YZ + Hiei, Spider Demon, Lancelot, PR Yog and a DC that either delays the boss or has a tumbler effect. All members are important if you're using this setup. Alternatively, you can bring more fire members and use those to kill the boss. 1, 2, 3, 4a, 4b, 5) Spin through. Turn on Lancelot whenever ready. 8a) YZ for dark and heart runes. Lancelot skill 1. 8b) Spider Demon, Hiei switch and EP skill 2. Spin with DC to delay by one turn. Kill on second turn. 10b) Spin through until his shield reads 40% or 65%. Full burst with Lancelot skill 1, Hiei EP skill 2, Zhuge Liang, YZ for dark. 10c) You'll have 30 runes cleared immediately thanks to Lancelot. Spin through the burning runes on the second turn. You should be able to easily clear on the monochrome runes stage.